The consumer market in America has been conditioned and driven by “what’s new” for approximately 70 years. Many manufacturers in a variety of industries come out with a whole new line of products every year to help stimulate interest in their products and brand from cars to fashion to electronic devices. New product development is the cornerstone of marketing in western civilization. Wagyu beef is not Kobe beef, BUT Kobe beef is Wagyu. Wagyu beef cattle can be any or a combination of the following breeds: Japanese Black, Japanese Brown, Japanese Shorthorn, and Japanese Polled. What most people don’t know is that Kobe is a city in Japan than became famous for the beef that it produces in its Hyogo Prefecture, and to this day the only place to procure true Kobe beef is from Hyogo Prefecture of Japan. Wagyu is simply a breed of cattle, much like Aberdeen Angus, Piedmontese, Charolais or Long Horns. Cattle breed types vary greatly, like most other domestic animals. Wagyu cattle are known for producing heavy marbling that far surpasses the marbling found in most domestic breeds of cattle. In America, there is a lot of misconception as to what Kobe beef is, many people confuse American Wagyu beef with Kobe beef and believe the two are interchangeable. While Wagyu beef is considerably different genetically than American breeds, the same feeding process is used to finish both breeds. In “American Wagyu” cattle it is not uncommon to do a partial cross with a traditional American beef breed, generally Angus, to create a Wagyu/Wagyu cross genetic that fits into the American beef production model better. 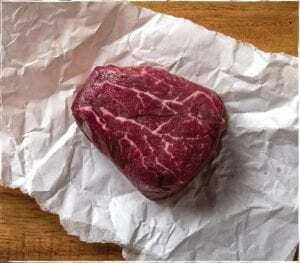 So why is Wagyu beef so much more expensive than other beef? Short answer; “time and feed”. It takes a minimum of 450 to 500 days on finish ration to produce Wagyu beef and many feed them for over 600 days. Compare that to the average 225 to 250 days on finish ration for most American breeds, like Angus, Hereford or Charolais. This is purely a difference in genetics. The first question that comes to the mind of most consumers is; “what happens if Angus cattle are fed for a longer time, will they marble like Wagyu?” and while this is a perfectly reasonable question, the answer is “No”. Why? Very simply, “genetics”. The Angus and Angus cross gene that dominates the U.S. beef production landscape will marble to a point, but after this point is reached it tends to add fat between the hide and carcass, increasing the “yield grade” (please refer to page 20 for our article on USDA Grading for a more in depth explanation of yield grade). Unlike the Angus and Angus cross cattle, Wagyu cattle continue to marble for a much longer period of time so long feeding them increases the degree of marbling. Or simply, Wagyu cattle require a great deal more time and feed to finish. Time and feed add a significant amount of cost to the cattle, this increases the overall cost of the beef. Is it really better?? That depends completely upon customer expectations. Wagyu is definitely a premium beef product. It is different than Angus and other domestic breeds. USDA Prime Angus beef is also an exceptional product. Wagyu generally exhibits somewhat more marbling than USDA Prime with some subtle differences in the fat type and content, but to say that it is “better” than high quality Angus/Angus cross beef is a bit of a stretch. It is very different, though, and is considerably more expensive to produce. Ultimately, the choice belongs to the customer and variety is the spice of life. We will continue to raise both breeds of cattle and proudly offer them for sale to our valued customers. At Nebraska Star® Beef we have a one of a kind program that was designed from the ground up to produce FROZEN all natural (antibiotic free, hormone free from birth) humanely raised, premium beef products. So, how does our program differ from others? Raising, eating and storing beef for 4 generations we’ve learned that CONSISTENCY is EVERYTHING. After our cattle are killed, we hang age the carcass for at least 21 days – the traditional way. Then we break the carcass down and wet age for an additional 35 days. It is then packaged in specialized high barrier material and blast frozen immediately. The beef is very literally “frozen” at its peak of perfection. Beef is then stored in a state of the industry cold storage facility at -10º F until it is shipped. When shipping beef we use dry ice (-109º F) to maintain this very low temperature as long as possible. This helps to maintain the product integrity created in the blast freezing process. As long as the time is taken to thaw beef slowly, each and every product from Nebraska Star® Beef will be very consistent from steak to steak or year to year. 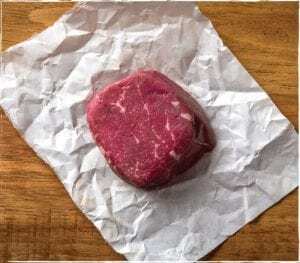 Delivering frozen beef in special packaging to the customer’s door allows the customer to keep the beef frozen for months – much, much longer than beef purchased fresh. Cattle are killed and quickly broken down into boxed beef. Within days, boxed beef moves quickly into the retail market where it is cut into steaks or ground into burger and placed on the shelf. The amount of aging can vary widely from a few days to a few weeks; the goal being to get it on the shelf quickly so that it has maximum shelf life. If the steak doesn’t sell for some reason or another, it’s ground and blended with other ground beef and other trimmings to create burger or ground beef patties. There is nothing wrong with this system, and it’s perfectly safe, but it makes it tricky to buy consistently aged product, and aging is critical to a premium beef experience. BBQ – Where does Beef Fit in? Barbecue is one of the most polarizing forms of cooking in the culinary world. Different regions have different styles of cooking, different styles and flavors of sauce, different woods for different flavor of smoke … and in each region, there is no other way than their way and that’s that. Barbecue, in the simplest definition, is one of the most raw forms of cooking known to man. It involves – heat, – generally from wood or charcoal – smoke, seasoning – sauce or dry rub – and a less expensive and generally larger size cut of meat. Less expensive cuts of meat are less expensive because they are usually a little more difficult to cook to perfection. The most iconic cut of beef used in barbecue is brisket. The brisket is roughly a 10 pound, particularly tough piece of beef that comes off the front of cattle, between the front leg and the neck. It is also very delicious when prepared properly. Each head of beef contains two briskets. Tough meat can be very difficult to eat. Traditional cooking methods for tough cuts are roasting, broiling and boiling; and none impart a great deal of flavor into the dish. Enter “barbecue”. While the differences in philosophy on the best way to barbecue can vary pretty widely, and the debate over the best way to barbecue are a hotly debated topic … the basic theory, at least from the physics perspective, is pretty much the same. A long duration of relatively low cooking heat – WITH SMOKE – to break down the proteins and render the fat out of the meat and impart a smoky flavor. This type of cooking can really help to turn a very tough cut of meat into something that is tender, juicy and amazingly delicious. Why low and slow? The answer is simple: Physics. When it comes to cooking a larger piece of meat it has to cook evenly throughout. If too much heat is applied too rapidly the outside will burn to a crisp and the inside won’t cook. If the heat is applied slow and steady, the whole piece of meat will heat up evenly. When the internal temperature of the meat reaches around 140° F, the fat will begin to render or melt and drip out. Rendering the fat helps to remove the fat from the cut of meat being barbecued, as the fat finds its way out of the meat, it frees up space for the muscle cells to expand as they cook, also making the meat more tender. This helps to keep them from rupturing and releasing cellular fluid inside them, which is what helps keep the meat juicy. 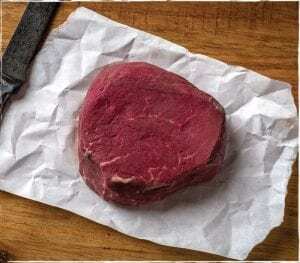 If the internal temperature of the meat is allowed to get much hotter than 205° F the cellular fluid can expand to the point the cell walls rupture and cause the meat to be dry and chewy. Rest time is absolutely critical. Getting the meat to the appropriate internal temperature without burning it is only about 2/3rds of the cooking in the barbecue process. After the whole piece of meat reaches somewhere between 195 and 205° F, it needs to rest for a while. The best way is in what the restaurant industry refers to as a “hot box”. A hot box holds the meat at a prescribed serving temperature which is usually in the 150 to 170° F range for extended periods of time. Meat should rest at least an hour and resting for multiple hours won’t hurt a thing – and will probably help in most cases. In lieu of a proper hotbox, a small cooler will work great. It is important to wrap the meat securely in aluminum foil and then fill any airspace in the cooler with old towels or something similar and tape it shut. This will provide an ideal resting situation for the meat. Resting allows all of the muscle cells and fibers to cool down some and relax. As they relax, they become more tender. After the resting period, a properly cooked large barbecue cut should almost fall apart on its own. Another thing that makes barbecue very unique, it’s actually a sub-culture unto itself is “Barbecue Sauce”. Barbecue sauces vary a great deal based on the region where the particular sauce originated, and some regions are even broken down further and defined by a particular style of sauce. North Carolina seems to favor a vinegar based hot pepper infused sauce – Tabasco or Texas Pete thinned with vinegar. Traveling down the coast to South Carolina, vinegar based mustard infused sauce is the standard. Georgia barbecue is known for taking South Carolina’s mustard sauce and adding tomatoes (or ketchup) to thicken it. Alabama stakes claim to a very unique white barbecue sauce. It is a mixture of mayonnaise, vinegar and peppers. Moving to the northwest, St. Louis and Louisville claim their tomato based sauces are thinner than the thick, sweet, smoky and syrupy sauce that Kansas City has made famous. Texas favors a “mopping sauce”, which uses molasses, tomato paste and vinegar along with peppers. It’s a thinner sauce, some even describe it as more of a “glaze” but leaves a thin layer of flavor on meat as it cooks which also helps to seal in the juices. Barbecue has become much more than a way to cook things, the United States in particular, has embraced barbecue and made it its own. Barbecue isn’t bound by types of meat cooked, or wood used for heat and smoke. The variety that each barbecue region brings to this style of cooking give it a very broad and deep personality.